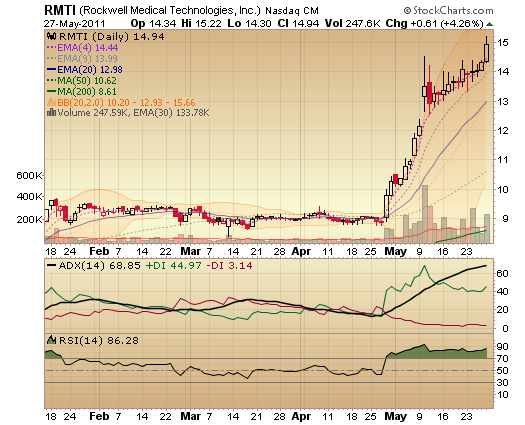 In a previous article I had discussed Rockwell Medical Technologies (RMTI) and its potential movement based on a new drug approval as well as their potential inclusion into the Russell Index. 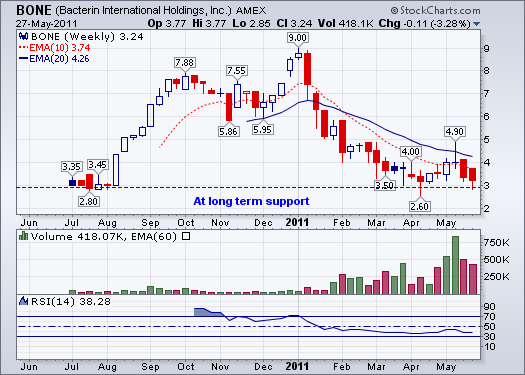 In addition, another biotech stock Bacterin (BONE), was mentioned that may also be included in that same index. Bacterin is a unique Biotech stock in that it has consistently grown revenues each year and has doubled them each of the last two years and achieve that feat this year as well. Along with rising revenues, the company is planning to be EBIDTA positive this fiscal year. This article will take a closer look at what Bacterin does and what potential is for future revenue and profitability. Bacterin consists of two divisions which both have very large potentials. The Biologics division just recently launched a new product and focuses on the development of revolutionary bone graft material. The total market for products they address are well over $8.5B. A recent product launch, Bacterin’s hMatrix® is an acellular matrix processed from donated human dermal tissue that is used to replace damaged tissue or repair, reinforce or supplementary support soft tissue defects. The estimated market for this material is over $2.5B and currently their production facility can be scaled to over $120M in revenue. The second division is the Medical Device and Coating division which has developed a proprietary antimicrobial coating for orthopedic implants that prevent or reduce staph infections. A recent product launch in Q1 is the needleless connector with anti-microbal coatings with a market potential surpassing $240M. These two divisions combined with multiple new product offering are expected to keep revenues doubling each year going forward, with one of the main reasons being their expanding sales forces, which has more than doubled last year. Independent distributors have gone up almost 4 times and when MedAssets (MDAS) acquired Broadlane last November this doubled the potential sites for the Biological division. In Q1 Bacterin was approved to sell to the entire MedAssets network. Last years revenues were around $15M, with the first quarter revenues around $6M. From their conference call the company predicts that they will be EBIDTA positive with revenues of around $7M/quarter. Given the company has averaged a minimum sequential quarterly growth rate of 15%, it seems likely that by Q3 the company will be well on its way to once again doubling yearly revenues and being EBIDTA positive. With very high margins the area they have been focusing on has been reducing sales costs. In the past year they have been moving towards a more direct sales force model, which will lower their total marketing budget substantially. While they have also spent a lot of money on marketing to get their products into major markets, I would expect to see these costs continue to decline as a percentage of sales going forward, thus leading to profitability in the coming year. The Russell re-balance will also take place in June based on the last trading day of May’s final closing price. For a company who’s just joined the AMEX a few months back, combined with the exposure they’ll receive when they will ring the opening bell at their shareholder meeting in July, they are certainly getting much welcomed exposure. Given its high growth profile in very high margin businesses, it seems like a very good match for the Russell selection, although criteria is based on market cap and not on how exciting a growth story the company has ahead of it. I’m a long time investor with investment experience in high tech, biotechs and precious metals. I blog on topics that are of interest to me and my goal is to generate intelligent discussion. I don’t consider myself an expert in any one area, but know a little about a lot of things. I believe as soon as we stop learning, we stop living. You can connect with me at SeekingAlpha.